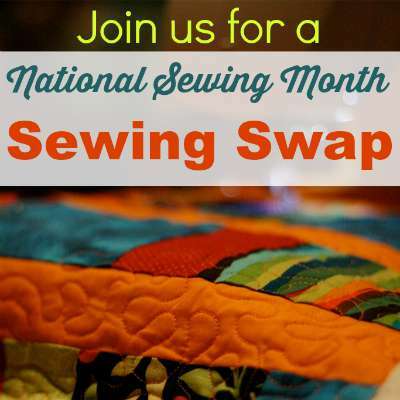 Did you sign up yet for the Sewing SWAP running for National Sewing Month? Launched last week, you can still sign up for it until tomorrow, 13th September. Then you have until 30th September to sew your mystery item, pack it with a small sewing gift and send it to your swap partner. Here are all the details in case you missed them last week. 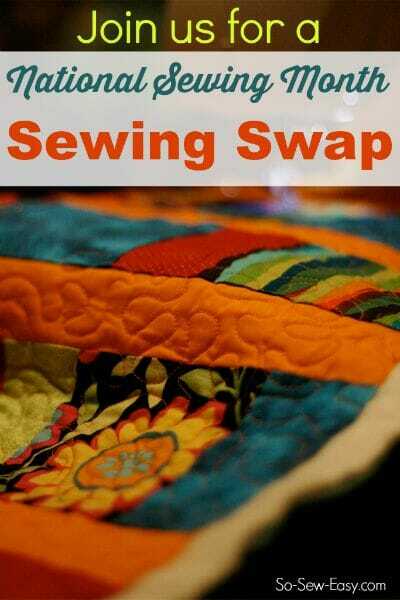 What is a Sewing Swap? In a nutshell, in a sewing swap, everyone who signs up to take part sews an item from a pre-agreed list of swap items and then sends it in the mail, as a gift to their swap partner. 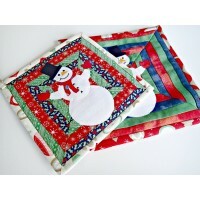 In return, they also receive a parcel in the mail with an item someone has sewn for them. What are we going to swap? 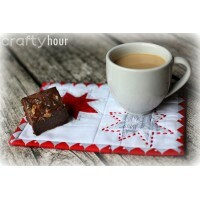 The huge majority of the voters said it would be nice to give and receive a small sewing gift in their parcel too. 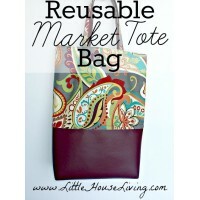 If you have fabric you won't use, but know someone else would love, send it where it will be loved. If you have buttons you don't need – send them to someone who might just think they are perfect! 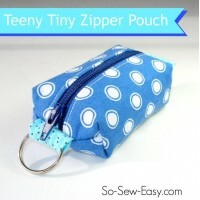 To make this accessible to all, we are setting the limit at $5 for the sewing extras. 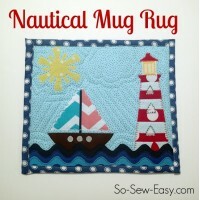 Items should be new and unused, and something that another sewer might be able to use, such as a couple of fat quarters, or some small sewing tool or notion, buttons, trims, ribbon, or other sewing accessories. 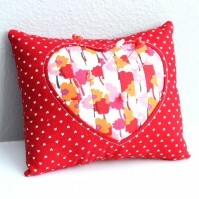 A pattern could also be sent so long as it wasn't to fit a certain clothing size, such as a bag pattern for example. Include these extras in your parcel – maximum value $5 please. 1. Who can participate? Anyone anywhere can take part. You'll be matched with a sewing partner in your own country as far as possible. That might not always be possible if you are the only one in your country who registers! If that's the case, then do be aware that you might be asked to send your swap item to another sewer overseas, and you'll be receiving your item from overseas as well, which will increase your postage costs. 2. 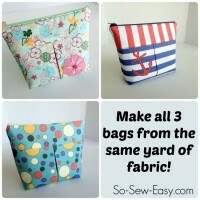 What level of sewing skills do we need? Everyone is invited to take part. The projects have been chosen so that they are accessible to everyone. Just do your very best work as you would for a friend and so long as you are happy with what you've made, then your recipient will be too. If you are participating, please do keep this in mind and be delighted with whatever you receive, even if its from a beginner sewer who is just starting out. We were all there at the beginning. 3. What about smokers? There were some concerns in the chat group where some people who were highly sensitive to cigarette smoke had taken part in swaps before and then received items from smokers. Everyone asked for smoking and non-smoking homes to be matched up separately. It's going to make it rather more complicated to arrange but we will do our very best to match you with someone suitable. Again, with some limited geography involved, it might not always be possible to get you an exact match in all countries. 4. What are the dates? You can sign up at any time from today until the end of the day (my time) on Sunday 13th September. 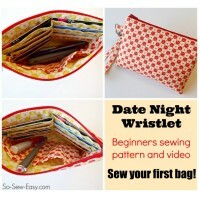 You can pick your item and start sewing right away. Then when all of the swappers details are collected, we'll start to make up the matches and send you your partner's name and address. 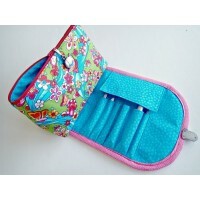 Please send your sewn item and additional mystery sewing gift no later than 30th September. 5. 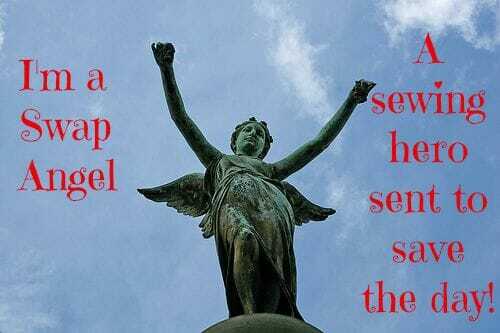 Do you need any Swap Angels? A swap angel is a kind-hearted person who volunteers to make additional items in case there are some members who drop out. Yes, if you have the time and resources to make additional items for members whose partner drops out, it would be very much appreciated. 6. What about drop outs? We all hope that won't happen. We don't want for any of us to take part, send out our carefully sewn item and then never hear anything back from our swap partner. But please be prepared for disappointment and keep a realistic expectation, and allow that these things can happen. Sadly in the event you don't get your item, I won't be able to personally make up a lot of spares and promise to send to everyone, but we will try to match you with a sewing angel if we can. As much as we all have good intentions, sometimes life just gets in the way. We sign up to something in the excitement of the moment, then forget all about it, or miss the deadline or just don't complete on our intentions for a multitude of reasons. So please ONLY sign up if you DO intend to fulfill your swap obligation. Thank you. There's a form ready and waiting for your details. You will obviously need to include your real name and full address in order that your partner can send you a parcel, and a working email address so we can contact you. Your details will only be shared with me, anyone who helps me to sort out all of the partners, and with your chosen partner. Your details won't go any further – promise. If you get junk mail it didn't come from me! 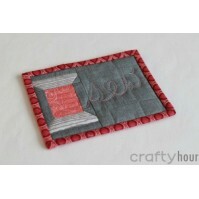 SIGN UP FOR THE SEWING SWAP IS NOW CLOSED. If you would like to participate please click through and complete the form with your personal details. We will match you with a suitable swap partner and email you their postal details for where to send the parcel. Thank you. Share your pictures of the items you receive over in the event group. Don't share what you are sending or you'll spoil the surprise. 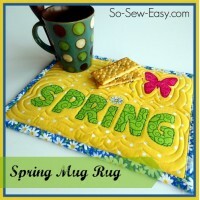 Have a great National Sewing Month. I am already entered and have received a partner. I will certainly keep this partner, but in the info I read it said that you would try to pair people up with someone in their own country and thereforebI was asking if that could still be done. I am paired with someone in the U.S and I am in Canada. I do not wish to pull out of this event so please do not delete my name. Thank you for your attention in this matter. Please remember that I am already signed up and partnered with someone. There was a check box on the form where you could select if you wanted someone in your own country or would send anywhere. I found your form and checked it and you had ticked that you would be happy to send anywhere. That’s why you received an international partner. I’m sorry for your disappointment. You could have checked the box that said ‘No, same country as me please’ and then I would certainly have given you a domestic partner. You had also signed up as one of the last few participants just before closing date and there were no other Canadians left without partners at that point. 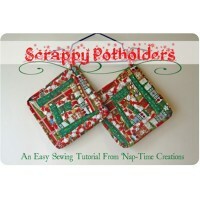 I am not sure if this is the right place but I had a question about the sewing swap. Is it possible to get a partner in my own country rather than outside of my country? 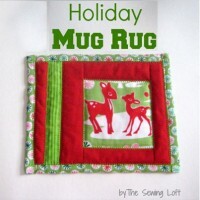 Sorry Virginia, the sign up for the sewing swap is now finished, it closed on the 13th. But if we run one again in the future, yes there is an option to pick a domestic partner only.